GRECE – Thèbes - The second field season at the Ismenion Hill and the area to the hill’s immediate northwest in Thebes has been completed. The excavations were conducted by University of Bucknell, the 9th Ephorate of Prehistoric and Classical Antiquities and the 23rd Ephorate of Byzantine Antiquities. In the excavations 2011-12, the team: a) cleaned the western temple remains in order to leave them as they were originally left after the 1917 excavations, b) created a local and internally consistent digital surveying grid system onto which all future archaeological remains can be plotted, c) digitally measured the exposed temple remains at every 10 centimeters and plotted each point into this grid to create a new temple plan, d) excavated five 5×5 meter areas and two 10×10 meter areas on the temple hill and in the area adjacent to the hill, e) recorded all excavation information digitally on iPads in the field and on laptops in the workrooms, f) excavated three late Byzantine graves (13th-14th centuries CE), g) excavated five undisturbed early Byzantine graves (7th century CE) and revealed a series of unbroken funerary vessels (over 20 in total) together with other grave goods, h) excavated a large Byzantine garbage pit from the late 13th century CE from which whole pots and a series of vessel profiles emerged, i) excavated and conserved a fine late 5th-century BCE Athenian askos, located and excavated a 2nd millennium BCE tomb (Mycenaean), j) located and recorded other features of note, such as walls of various periods and cuttings in the bedrock that may relate to the foundations and/or adornment of the 4th-century CE temple to Apollo. The third archaeological survey will be conducted in 2013 (June 17-July 26). ROYAUME UNI – Seven Lows - An archaeological dig in Delamere has uncovered items believed to date back to the Bronze Age. The dig, which took place at the Seven Lows barrow cemetery on Fishpool Road in August, uncovered several historic items including cremation urns and flint tools. Although full analysis has not yet been carried out, archaeologists believe the items to be from the Bronze Age. Dan Garner, archaeology project officer for Habits and Hillforts, a group that focuses on the hillforts that line Cheshire’s Sandstone Ridge, said the group is currently analysing the items and the cremated human bones found within them. He said: “We hope to have the results of analysis of the cremated human bone by the end of November. Hopefully we’ll be in the position then to give more detail regarding the age and gender of the individuals buried in the urns and how many hundreds, or even thousands of years ago they are from.” The Seven Lows barrow cemetery lies at the head of the valley of the Sandyford Brook, and is a group of seven Bronze Age bowl barrows. Only four of the mounds are still visible, with mounds two and seven having been de-scheduled as ancient monuments in 1994 on the presumption that they had been destroyed through repeated ploughing. But after reviewing collected data and carrying out a series of geophysical surveys, HH discovered that the site of mound seven was still exhibiting the remains of a slight earthwork in the form of a ring encompassing the top of a low hill. A training excavation undertaken by HH in August placed a 2m wide and 50m long section across the centre of the ring detected using non-invasive surgery techniques. “We recovered fragments of worked flint, burnt bone, prehistoric pottery and part of a large pit,” said Dan. “We then went on to find four cremations urns which we are currently analysing but believe to date between 1500 and 2000 BC.” The most unique find was a small piece of worked bone, thought to be a toe bone from a sheep or goat, which had been made into an object resembling a toggle or bead. USA – Tampa - When the University of South Florida golf teams’ new training facility was constructed this summer and the existing training building was demolished, the land being disturbed was not just a part of USF’s golf course, The Claw. The golf course also contains known prehistoric archaeology sites — places where humans lived thousands of years ago and left evidence of their habitation. Because the sites are on state-owned land, archaeology professor Nancy White said, there are laws against disturbing it without prior approval and in some cases, archaeological surveying to protect and preserve cultural artifacts. The archaeological site on the golf course was discovered by USF archaeology students in the 1960s during construction around an astronomical observatory building, which was renovated and used as USF’s former golf training facility, and contains evidence that humans lived there as far as 5,000 years ago, according to the project report. Another site, Buck Hammock, is located in woods to the east of the golf course, and is a burial mound, a sacred place for prehistoric Indians, White said. The location of the new golf training facility is southwest of known prehistoric sites, though, according to the report, “since neither site has been extensively excavated, the boundaries are tentative.” Artifacts such as stone tools, including two projectile points, and ceramic pieces were found, as well as flakes produced from when stone tools were created, she said. The shapes and style of the points were used to date the site, according to the archaeological report, to between 4,000 and 1,500 years ago. Ceramic pieces dated from 2,000 to 1,000 years ago. GRECE – Herakleion - Exhibition hall of the Minoan wall-paintings at the Archaeological Museum of Herakleion (Crete) (re-)opens its doors to public on Sunday, November 4, in the framework of the project “Re-exhibition of the Collections of the Museum”, which is being co-financed by the European Regional Development Fund and public funds. The wall paintings from the Minoan palaces and mansions showcased in the new exhibition are among the most important exhibits of the Museum. 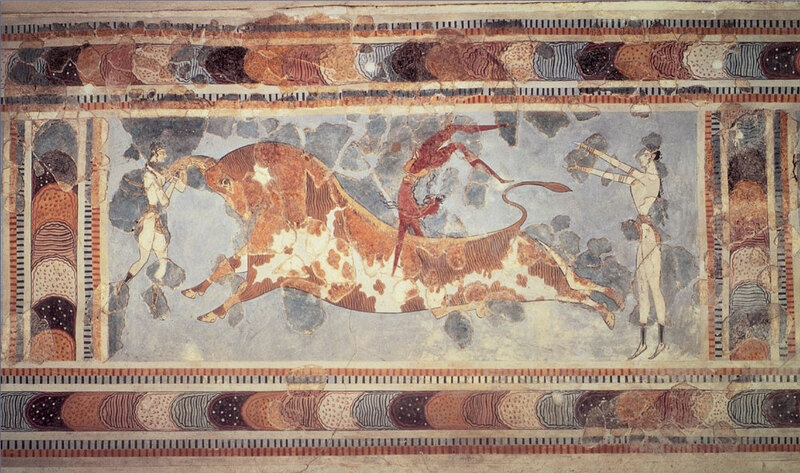 They are all of high-quality painting art and depict aspects from the Minoan world, such as scenes of social life and religious activities, the Minoan palatial court and the Cretan nature.